Due to some issues in his personal life Nicholas Cage has been making some interesting choices when it comes to his acting career. 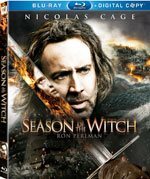 The latest in these is Season of the Witch, a fantasy adventure starring the aforementioned Cage and Ron Pearlman. The film opens with the execution of three women accused of being witches. All of the women insist that they are innocent of their crimes but the local authority refuses to listen. They are executed and without being given last rites. The priest of the village knows this is a bad idea but must conform to the mayor's wishes. That night when the priest tries to perform the rites on the women, one of them rises from the grave and attacks the priest. Cut to an impending battle and we are introduced to Behmen and Felson (Nicholas Cage and Ron Pearlman) two knights fighting in the crusades. The next few minutes are a montage of battles and victories where the invading knights storm over local villages spreading their religion. As the carnage continues it is clear that Behmen is becoming disenchanted with this way of life. When Behmen slays a young girl during a battle he comes to the realization that he can no longer fight for this cause. Behmen attempts to leave and in so doing angers the chaplain. Felson helps him escape and they go on the run making their way across a land being overrun by plague. After arriving in a large city they are captured by the local authorities but instead of being executed they are taken before the bishop who offers them the choice of escorting a witch across the land or being hanged themselves. Of course they take the witch across the land. Accompanied by another priest and a vagabond they make their way through a dangerous forest. What makes matters worse is that Behmen feels even more conflicted about what happened during his last battle now that he is escorting this girl because she insists she is not a witch. When they do finally make it to the castle where the girl is to be executed it is clear that there is more going on than what they think. All along the journey they have been assailed by dangerous creatures and strange visions. When the monk at the keep arrives with the book said to hold a spell to banish the witch everyone believes they can finally rest easy but unfortunately that is not the case. It is difficult to say something positive about this film, Nicholas Cage has given us some great performances over the years, The Weatherman, Leaving Las Vegas, and Wild at Heart but lately he has decided to go for the bottom of the barrel and this film is no exception. From the weak plotline to the hollow performances from everyone it's a wonder how this film got made. For those looking for the usual escape movies bring Season of the Witch leaves the movie goer longing for a return to our everyday life. Now on Blu-ray disc the film can be enjoyed by those fans out there who love a good campy story. Overall the film looks good through the Blu-ray treatment and it boasts a decent audio experience with 5.1 DTS-HD Master Audio. The movie is packaged as a 2-disc set, the second being a digital copy of the film. The first disc contains all the extras, which include: deleted scenes, a doc on how they created the CGI demon at the end of the film, another doc on how they went about depicting the crusades at the start of the film and an alternate ending. In the end, Season of the Witch is just another example of bad movie making and bad story telling. What is truly amazing though; movies like these will continue to be made and there will always be people who are willing to go out and see them.